More than 150,000 patients have undergone DBS. The present day techniques make it a very safe procedure. Before discussing the surgical steps, one needs to understand various components of the DBS system. Though, as a patient, you may not need to get to choose between them, your doctor can best advise you on the most appropriate solution. (i)The IPG: is a battery-powered neurostimulator encased in a titanium housing, which sends electrical pulses to the brain to interfere with neural activity at the target site. (ii)The lead: is a coiled wire insulated in polyurethane with four platinum iridium electrodes. (iii)The Extension: it is an insulated wire. The lead is connected to the IPG by the extension. The Lead is placed in the targeted region of the brain through a small burr hole. The extension wire connects the leads to the IPG. The Extension runs from the head, down the side of the neck, behind the ear to the IPG. The Functional Neurosurgery department in Jaslok Hospital & Research centre is a sophisticated and well-equipped department for Parkinson’s disease surgery treatment which is being headed by Dr.Paresh Doshi, Functional & Stereotactic Neurosurgeon. Patients will consult the Neurosurgeon in the out-patient department. He will select the best candidates for deep brain stimulation with Parkinson’s disease who had responded well to medical therapy early in the course of their disease. After evaluation and the selection of the candidates he will explain the Parkinson’s disease surgery, its risks and benefits and display some video footage to such candidates and their companions. These candidates have to be instructed that they must not take drugs like aspirin, clopidogrel or any blood thinner 10 days prior to Deep Brain Stimulation surgery, because these drugs can increase the risk of bleeding during the surgery. It is also very important that at the time of admission patient does not have any dental, urinary or other form of infection. If there is any doubt of this, the surgical team should be informed. Hospitalisation of the candidates for Deep Brain Stimulation surgery will be for around 10 to 12 days. First day of admission a resident doctor will conduct neurological examination on the patient. He will also conduct a study on the history of the patient to rule out if the patient has any medical conditions such as heart disease, Hypertension and diabetes etc. The patients are advised to disclose about any such illness for better evaluation prior to the surgery. Routine investigation such as blood test, ECG, 2D Echo, X-Ray of chest would be carried out on the patient prior to Parkinson’ Disease surgery. Anti-Parkinson’s medication is stopped around 9pm on the day of admission. This is required for performing standardized testing using the Unified Parkinson’s Disease Rating Scale (UPDRS) and mini-mental state examination score (MMSES) that will provide information such as how the brain of the patient stores and retrieves information and how it functions. After the tests are performed video recording is also done. This is known as OFF phase evaluation. Thereafter the patient is given 1.5 times his usual L-dopa dose and the same tests are repeated. This is ON phase evaluation. Parkinson’s Disease Questionnaire 39 Items (Global QoL) will be given to the patient and Zerith Caretaker Burden Inventory (ZCBI) will be given to caretaker/s of the patients to be filled by them. Finally, a pre-operative Magnetic Resonance Image (MRI) of the brain, that is the key to the success of this operation, is examined by the neurosurgeon. It serves as a roadmap which can be followed during Parkinson’s disease surgery by the neurosurgeon to ensure proper electrode placement. Parkinson’s disease nurse helps to promote a relaxed and supportive environment. Patients are encouraged to express his/her needs so as ensure greater patient cooperation and comfort during the Parkinson’s disease surgery. She spends considerable time explaining and going over the surgical procedures with the patient and their relatives. Repeated interaction not only boost confidence in the patient but also bring out important observations that are reported to the surgical team to ensure patient safety and smooth conduct of the operative procedure. Care from an established and knowledgeable team of nurses within the ward allows the patients to gain confidence in those who will look after them during the following admission. Day two evening the pre-op preparation will start with pre-anaesthetic check up by the anaesthesiologist and head shaving, after obtaining consent. Consent form should be signed by the patients and their spouse or close relatives for surgery also. After midnight patient will not have any food and any Parkinson’s medication. At 4 A.M. patient is given a banana and a glass of milk or a chocolate. At 6 A.M. the patient should be bathed and kept ready. Once ready, the resident doctor will pay a visit to the ward and the patient will be shifted to Operation theatre at around 7.30 A.M. The OT staff will begin preparation for the surgery which will include insertion of an IV administration of antibiotics and IV fluids and monitoring of the patient’s vital signs like BP, pulse. A urinary catheter will be inserted by the resident doctor in the OT. The entire surgery takes around 5 to 6 hours. The stereotactic frame will be placed under local anaesthesia. This is a head ring which is attached at 4 points to the patient’s skull. An anaesthesiologist will be present for placement of the frame to offer some light sedation, to ensure patient comfort. 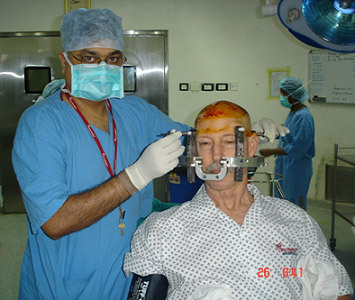 The patient will be awake during the Parkinson’ Disease surgery as the operation would be done under local anaesthesia. Surgery begins with drilling a hole on the top of the skull. This is a painless procedure as bone and brain, both are insensitive to pain. Following this thin DBS electrodes are inserted into the brain to obtain the brain map, this is what is known as micro-electrode recordings. Once the correct location is identified, a low voltage current is administered to find out the level of improvement that can be achieved and to also check for side effects. This is the stage where patient cooperation is very useful. In patients experiencing tremors, there will be arrest of tremors, patients with pain will report relief from pain and the most important is the loss of stiffness that is observed on stimulating the correct target site. Once adequate confirmation is obtained by the surgical team, permanent DBS lead is implanted under fluoroscopy guidance. Following Parkinson’s disease surgery, a check CT scan is performed to confirm the position of electrodes and rule out any complications. The patient is then transferred either to the ward or the ICU for observation. Here he is given the dose of his L-dopa and allowed to have his meals. On the next day, a pace maker battery called as IPG (Implantable Pulse Generator) is implanted under general anaesthesia. A few days after the surgery some patients can experience changes in the symptoms. There may also be a micro lesion effect caused by the actual electrode placement in the brain and the reaction of the brain after the placement. In the next stage, the IPG battery will be activated and the programming is set to see response of the contact points and their side effects. Settings will be done on good contact points and the anti-Parkinson’s medications doses will be adjusted. Once optimum stimulation has been achieved the Parkinson’s Nurse will start involving patients and their family members in educating them on how to use the device therapy and handling post-op care at home once the stitches are removed and the dressing done on the 8th day of post-op and patient is declared fit for discharge. Patient goes home with the dressing and after two days dressing should be removed and healex spray (waterproof spray) should be applied on the suture line. While doing this if they observe any bleeding they should visit their local hospital and get the sterile dressing done by a surgeon and inform the same to us. The list of precautions and the instruction manual of care will be given to the patients and their family members. Provide on-going support for the patient, relatives and professionals through telephone contact. A discharge summary detail is provided to the patient, including contact numbers. The patient’s follow-up appointment will be after three months. The neurosurgeon will see the patient at out-patient department in two weeks after discharge to review progress. This level of support continues, particularly during the stabilization period of four to six months. The aim is to achieve a comfortable, effective level of stimulation, which controls symptoms adequately, in combination with drug therapy. Routine follow up will be yearly (or as and when advised or required). Patient can also operate the device independently at home to adjust the current or the voltage according to their requirement.